Basement finishing Salt Lake City by Utah Basement Finishing is your perfect option if you want to give your home an additional living space. A finished basement almost doubles the original size of your house at a fraction of the cost of adding a new room. With our design services, our team will help you plan and develop your dream basement while keeping a keen eye on your budget. We provide in-home consultation and free estimates for all projects and a follow-up meeting with our basement experts to discuss the estimate in detail and give you a walk-through of how the basement finishing Salt Lake City will look once completed. 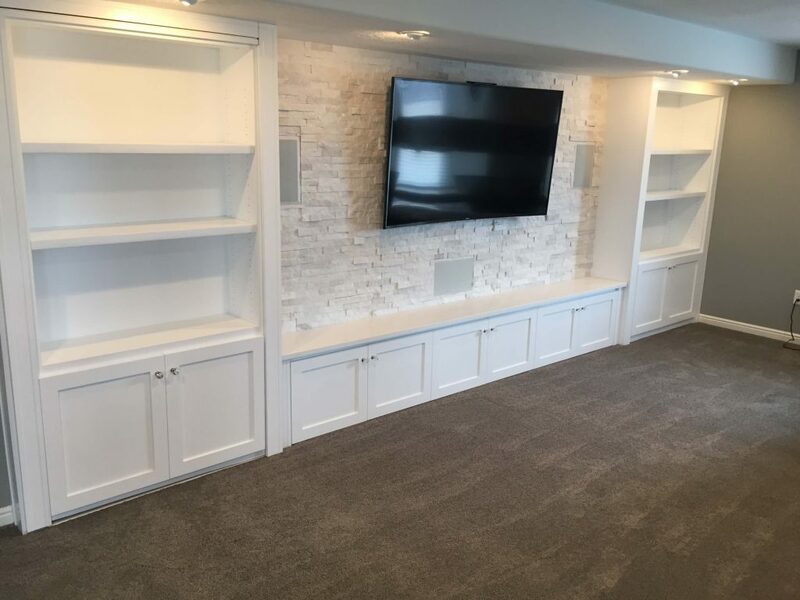 It doesn’t matter if your basement is used to entertain family and friends or you simply need a bit of extra space for your kids, Utah Basement Finishing will make sure that you are totally satisfied with your brand new living space. Is your basement finished already? We have basement remodeling services that can give new life to your old, dark, and drab basement. Having your basement remodeled is a budget-friendly way to give your home its much needed improvement. During basement remodeling, there are several ways for you to improve it through including add-ons in your renovation. You can choose from an array of appealing options that can add more life to your basement space and turn it into an ideal recreational addition to your home. One of the best ways to enhance the appeal of your basement is to have a fully stocked bar installed with a plethora of drinks. This can make your basement the perfect spot for parties or any other social gatherings you can think of. You can also include a refrigerator and a sink with your bar to let you form a complete kitchen wherein you can prepare food, drinks, and have access to water with no need to waste your time going back and forth to your upstairs kitchen. If your basement has enough room, you can easily transform this into a wonderful place that houses your home theater entertainment system. You can install theater seating, full-sized projection screens, and surround-sound stereo systems to make your basement one of the most exciting parts of your home. If a theater or pool bar is not a good addition to your basement due to budget or space constraints, there are lots of other exciting add-ons that can definitely improve the appearance of your finished basement. For instance, many basements are constructed with basement beams that can be decorated with the use of custom trim to blend with the overall look of your home and basement. Crown molding along the bottoms and tops of the columns can make the beams more attractive. You can also add finished staircases and doors to your basement. Give your visitors a good first impression with a staircase that will greet them with the best quality of wood railings and other stunning designs. Contact Utah Basement Finishing for top of the line basement finishing Salt Lake City.